If you walk among Britain’s historic cathedrals, you may find the altars there to be made of a beautiful white marble with a distinctive interwoven green serpentine. It is a rare and holy stone, a marble only found in one place in the world, the Holy Isle of Iona. 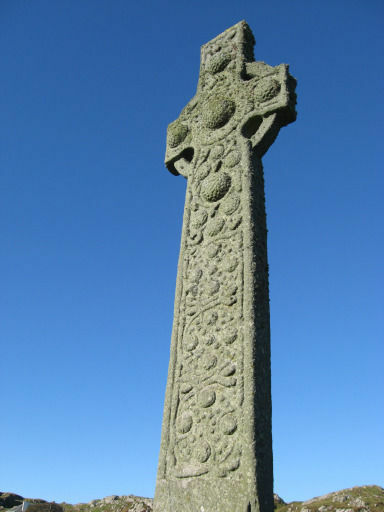 In 596 Saint Columba and twelve of his monks sailed from Ireland to the small Scottish Isle of Iona. He was on a mission to share the peace of God. 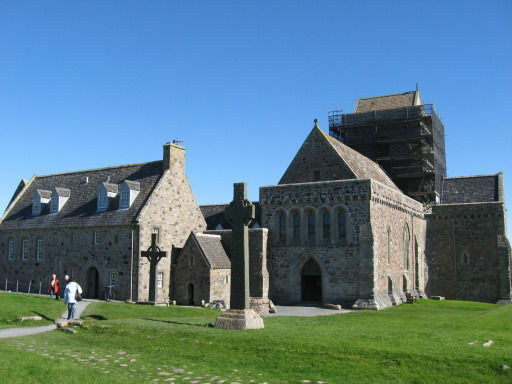 Upon landing on a sprawling pebble beach, Columba quickly went to the task of building an abbey and way of life for he and his men. What he would begin building on this small island, only three miles in length, one mile in breadth, would grow to become the launch pad for Christian missionaries sent throughout Britain. My wife Abbie and I were invited to Scotland by this island. As we were seeking to discern whether God wanted us to go partner with a church in Scotland for a year, a dear Scottish friend of mine sent a letter with a single picture. The picture was a simple landscape of a field with a path leading to the ocean. 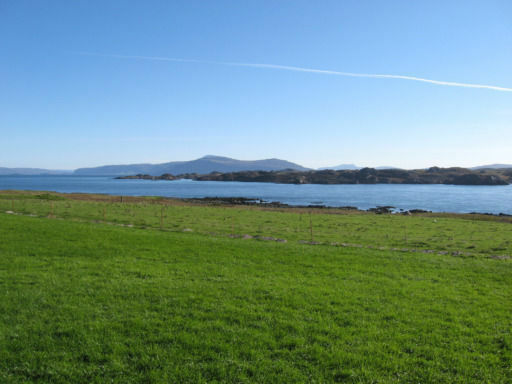 Only I had never seen grass so vibrantly green, such a lively blue ocean or such a clear sky. The island invited us through this picture to come breathe its air. After being in Scotland for several months, we made the journey. A train from Glasgow to the seaport of Oban. A ferry carried to the Isle of Mull. A bus on the one lane road across the island, pausing occasionally for roaming sheep. A night ferry across the final sound to the Holy Isle. We stepped off the ferry. The only light came from the heavens, the only sound from gentle ocean waves and pleasant voices. The air was enlivening. We were greeted by the host of the bed and breakfast where we were to stay, one of the hundred residents of the island. He was warm, polite and conversational. We would perhaps see him throughout our stay, besides at his B&B, he was also out and about running the only taxi for the only road of the village, and raised sheep. We told him we looked forward to seeing him around, and then slept well that night. In the morning there was no rush, only beauty. The sun illuminated the vibrant colors that our picture had told us about. Outside the B&B we met black sheep and open fields. We walked a centuries old path towards the Abbey. Two stone crosses guided our last bit of the walk, both standing at an impressive ten or eleven feet. We found that the cross of St. Martin had stood where we found it, silently telling stories of the Bible for over a thousand years. I touched the cool stone. Now, I’m not too much of an emotional guy, but I felt connected across history in a way I cannot described to the untold numbers of believers who viewed, learned from and touched this stone. The backside of St. Martin’s cross bears old pagan symbols. When Columba had come, he did not denounce all of the dear beliefs that the people on the island held. He instead offered what he believed was a fuller revealing of the divine in which they believed. This approach guided Columba’s followers to incorporate native symbols, interpreting them in light of Jesus. Good men had lived here, invested their lives here. As I touched their stone work, I touched them. From the cross of St. Martin one could see the cross of St. John, right outside the Abbey. At one point the island had been filled with stone crosses, beginning at the docks. They were set up as a path to the abbey. That day, the crosses of St. Martin and St. John continued to do what they had done for centuries of sojourners; they showed the way. We arrived at the humble stone cruciform Abbey and found within it the daily rhythm of the island. Within its walls, every morning, afternoon and evening, there is a time of prayer and worship, built literally and liturgically on the foundation of Abbey Columba raised. Rich architecture and residents of the Abbey greeted us after the morning prayers and together they soon told us the story of the place in which we found ourselves. Every nook and hill had a story and what captured us most was that as we worshipped within the Abbey, we joined the story of this place. After lunch we headed west towards the “bay at the back of the ocean.” A wide field spotted with black sheep and split by a beckoning path separated the small village on the east coast from the bay at the west coast. Again the simple beauty of only hearing and seeing and smelling nature greeted me, refreshed me. We began to realize why this was such a special place, why the stones from this isle were regarded as holy – so much was right about this island. We wanted more of the world to be like this place, to foster connection with God, with fellow humans, with creation, with history. These connections created peace. This island breathed peace. We soon reached the bay, with the ocean ablaze from the afternoon sun. The bay at the back of the ocean is one of westernmost coasts. Abbie and I gazed out over the pristine white sand and blue waves and realized that just over the sea lie where we came from, our friends and family. Likewise all our lives, this beautiful island had been waiting for us, just over our horizons. After sitting in the sand realizing these simple truths, we spent a long time meandering along the beach and the surrounding sheer cliffs, enjoying time together with each other and the island. As evening fell we headed back to the village. Two small hotels offer dinner on the island. We went to the first and were delighted to find fish caught that day and island grown fruits and vegetables on the menu, all served by candlelight. It was perfect. By moonlight we walked hand in hand back to the B&B for another restful sleep. The next day we took in the village and met a wonderful pastor from of all places, South Carolina and a group of silversmiths of the island who use the islands historical art in their work. We spent a good while in their shop, one of several small shops selling handmade soaps, candles and paintings. I was amazed at how quickly strangers became friends here. We then struck out South towards the bay of. 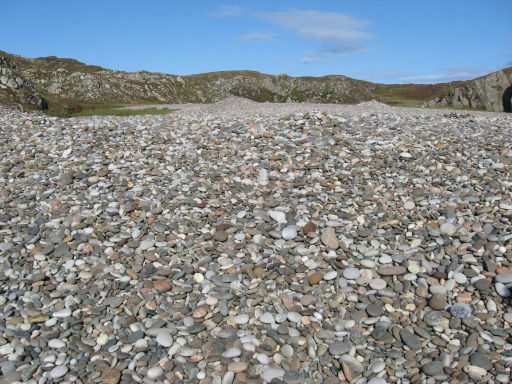 Columba, the pebble beach upon which he first landed. No path led us this time, only gently rolling hills. At one point Abbie rested at the base of a hill while I hiked up. She told me she just sat enjoying the gifts of the island that captured so much of the way things should be. We continued on and didn’t see anyone. The whole afternoon we were alone among the hills, it was as if, for the afternoon, the island had lent itself to us to have for our own. We made it to the pebble beach and found that “pebble” may be a bit of a misnomer. 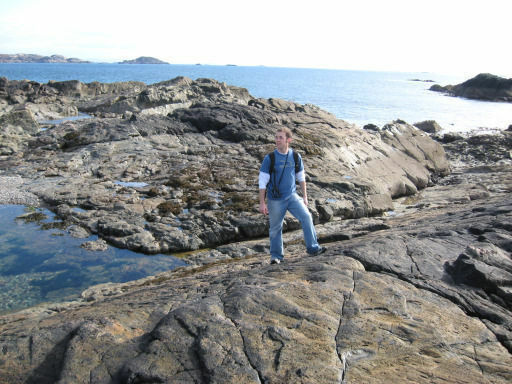 Smooth rocks ranging from fist-sized to outstretched-hand-sized filled an entire beach. The tide was low, exposing a series of broad rock formations. Like 1st graders on a jungle gym, we made our way to the coast and then jumped and climbed and explored the exposed rocks with their rock pools and small waterfalls, collections of barnacles and smooth pebbles. It was the most fun I’d had in years. We walked back to the village in time to enjoy an equally tranquil, local and delicious dinner from the other hotel. Then by moonlight we made our way to the Abbey for an evening Eucharist. This sacrament embodied our experience of the island and was a fitting ending to our time there. The Abbey was filled with a table spanning the entire length of the floor. Around the table sat residents of the Abbey, the silversmiths, the pastor from South Carolina, a nice German couple we had met on the way in. Here we communed; we connected with one another and with God, through gifts from creation – bread and wine. We all ate of one loaf, drank from one cup, shared this time and place. We were connected by the belief of a loving God, and relationship with Him, each other and creation. 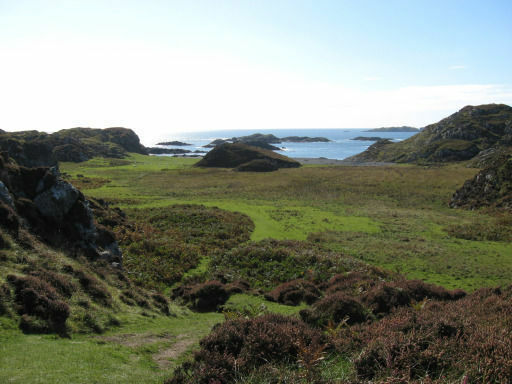 The isle of Iona was for us a place of communion, of connection, a glimpse of how the world should be. It is my hope that today we still carry a bit of the island with us, planting it, so that our village in America may slowly be able to grow more connected.